Families and friends don’t get together to watch their favorite shows like they used to. In fact, the Future of TV seems like it’ll be a one-to-one experience (one screen, one person). But, this isn’t actually the case. The Future of TV involves larger communities…digital communities to be specific. So, how did we get to this awkward transition of entertainment? 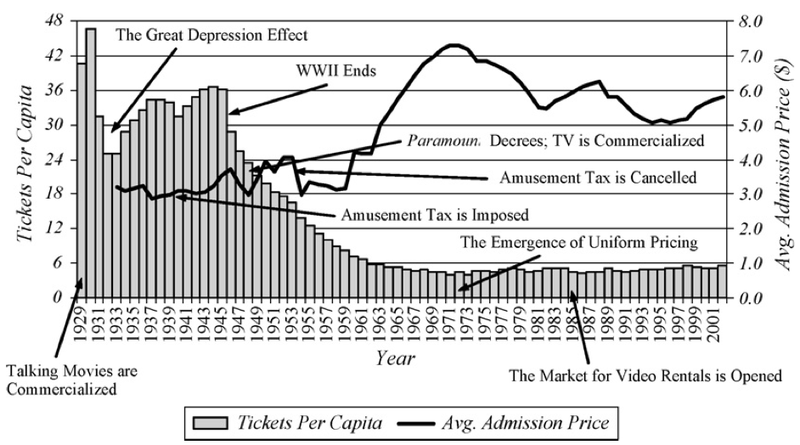 When the silver screen was replaced by the TV in the 1950s, movie ticket sales plummeted over the next decade from 25 to 4 tickets per person per year. Today, the TV is being replaced by the mobile phone, with 39% of TV users canceling or downgrading their paid-TV subscription in the past year alone. It is clear that entertainment is now expected to be ready when the user is ready, not on some programming schedule. Entertainment has transformed from a special event to a daily ritual – squeezed into every free minute of our days. Because of this, we’ve lost the communal factor of entertainment. One day this winter I looked around my apartment and realized six people were watching six different Netflix programs on their laptops. Netflix and YouTube have given us the opportunity to watch what we want, when we want, at the cost of watching with other people. Undoubtedly, though, being entertained alone isn’t nearly as fun. Laughing to yourself, explaining a theory you have on a show to an empty room…not the best experience. There’s still a part of us as humans driving us toward a sense of community and belonging. Which is why the Future of TV is still being created. Surprisingly, the gaming industry is setting the example. Playing video games is usually pegged as an anti-social activity. My mom always used to tell me to get off the game and go play with friends. But, the recent rise of the video-game streaming platform, Twitch, has broken down all stigmas and made playing video games a social event. Every day, 10 million people log onto Twitch to watch their favorite video game players. 10 million! If you’ve never heard of Twitch, this may sound like the most bizarre thing ever, because it is. In the past, we’ve had digital communities with the sole purpose of socializing (AOL Instant Messenger and Facebook Groups). But, Twitch is showing us what it means to create digital communities around entertainment – just like movie theaters once did. Twitch’s digital communities want to be entertained, and they want to be entertained alongside hundreds or thousands of people just like themselves. So, why doesn’t TV adopt this communal viewing aspect? Well, there is a Chrome Extension called Showgoers, which allows you to watch Netflix remotely with friends and family. But, it’s nowhere near the hit that Twitch is. That’s because the secret behind Twitch’s success is the video game players themselves. The average daily Twitch viewer watches 106 minutes of content in a day because they fall in love with the star gamers. My roommates happen to be one of those star gamers. Every night between 8pm and 3am he plays video games for an audience of 2,000-10,000 people. Some of the more popular gamers corral upwards of 200,000 live viewers. So, what can the Future of TV learn from these unconventional digital communities? Twitch is raw, uncut, and authentic. Vastly different from the uptight, micromanaged performance of TV. This freedom of expression is what allows people, not brands, to grow massive audiences on Twitch. Further, Twitch stars have the ability to talk with their followers and build trust. At times, my roommate knows more about what’s going on in his community’s lives than he does mine. This trust coerces followers to give donations and support their entertainers. The Future of TV is trending away from massive production costs and highly polished product. Viewers want REAL people with REAL stories that they can trust. Disney, Time Warner, Turner, and others created high barriers to entry in the TV industry and now it’s coming around to bite them in the “you know what”. Digital communities trust people over brands and you are embodying this fact by reading this article. Incumbent entertainment and media companies can either go down with their sinking ship. Or, they can find a way to empower independent content creators and embrace this democratization of entertainment. With nothing to lose and everything to gain, it’s the decade of the independent content creator. And all forms of media are up for grabs. Those with nothing to lose can hide in the shadows, work swiftly without disruption, and pop-out from the shadows by taking the biggest risks. And it’s not just about having nothing to economically lose. Having nothing to lose is a mindset. It’s a mindset that inspires you to take action when others would shy away. Kind of like how Warren Buffett says to be greedy with investing when others are fearful. Rewiring our brains to pretend we have nothing to lose is the courage boost we need to act against our cautions. However, there’s a proper balance of the nothing to lose mindset, which you must find through experience. I’d love to hear your thoughts, good or bad, on this week’s Quick Theories. You can reply directly to this email. The ‘nothing to lose’ mindset you mentioned much reminded me of the fear of failure the brother Kelley describe in creative confifence. The idea is that if you manage to build or regain confidence in your creativity, as in your ability to create, then you are eventually able to change the world and do stuff everyone thought impossible. As for the mindset itself, their theory is that if you have a growth mindset, then you can learn pretty much anything in order to get to your goal.